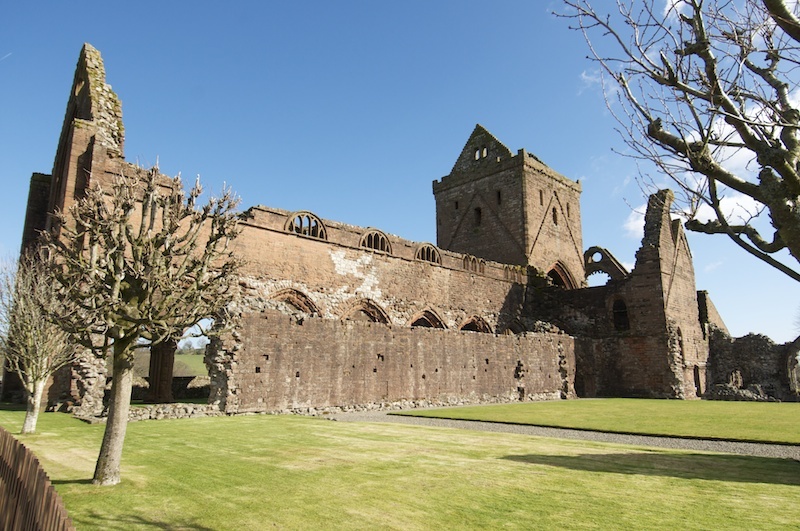 Just a mile or so from the estuary of the River Nith, which flows into the wide Solway Firth south of Dumfries, are the mellow sandstone ruins of Sweetheart Abbey. 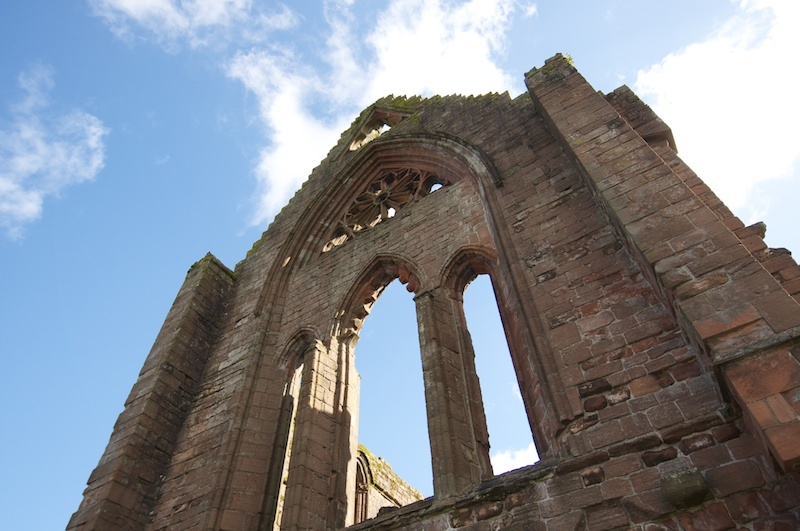 Founded in 1273, Sweetheart Abbey owes its existence to Lady Devorguilla, the widow of John Balliol, who signed a charter to establish a Cistercian monastery in memory of her late husband. 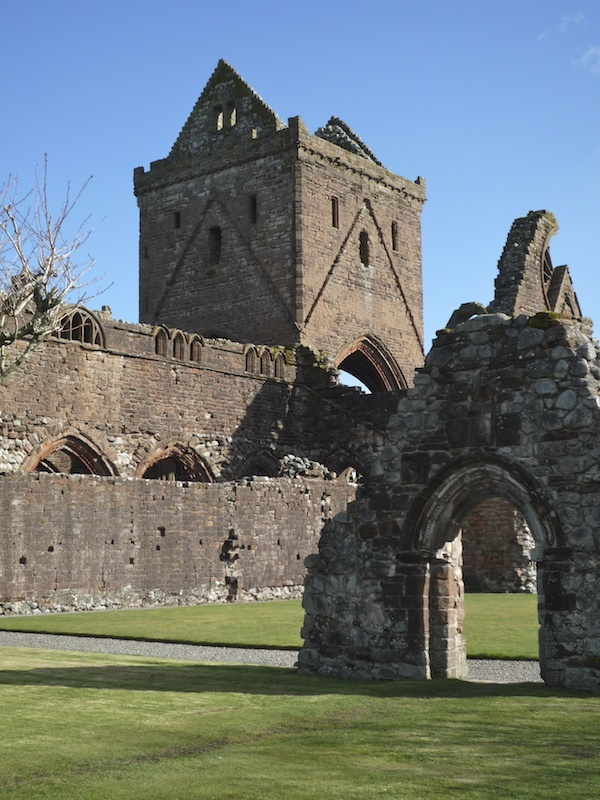 Devorguilla was the daughter of a rich family in Galloway; a great grand-daughter of David I of Scotland, she inherited the estates of her father, Lord of Galloway, when she married John Balliol in 1223 at the age of 13. John Balliol was born in 1205, the son of a landowning family in Durham. In 1250 he was appointed by Henry III of England as a joint protector of the young Alexander III, King of Scotland. The English king had big ideas about Alexander, and by marrying him to his daughter, Margaret, he hoped to resolve the long-standing Scottish question once and for all. Alexander had other ambitions, and when he reached the age of 21 he set about reinforcing Scotland’s hopes of independence: one of his first acts was to win back the Western Isles from the hands of Norway. When John Balliol died in 1268, such was Devorguilla’s heartbreak that she was inspired to have his heart embalmed so that she could carry it around with her in an ivory box. Before we judge her too harshly, it must be remembered that this kind of act was fairly common in the Middle Ages; the hearts and various other body parts of kings and queens were often taken on individual pilgrimages of surprising distances, long after they were required by their original owners. In 1330 the heart of Robert the Bruce was taken to Spain in a casket, where, at his request, it was borne into battle against the Moors. Whatever the Moors had to say about that, we will probably never know. Together, the Balliols left behind them an enduring legacy in the form of Balliol College, one of Oxford University’s oldest colleges, which they founded and supported. The statutes of the college were drawn up in 1282, and apparently the original documents still survive. When she died in 1289, Devorguilla was buried in the Abbey and her husband’s heart was finally laid to rest beside her; today, the site of her tomb is marked by a monument in front of the altar. John and Devorguilla had nine children, and their son, also called John, was destined to become King of Scotland. In 1290, the succession to the Scottish throne was thrown open with the untimely death of Margaret, ‘the maid of Norway’, who was the grand-daughter of Alexander III. The younger John Balliol, tracing his ancestry back on his mother’s side to William I and David I, had a strong claim to be Scotland’s next king, and he did succeed – but perhaps not in the way he would have wished. Within a very short time he found himself a puppet of the ambitious and powerful Edward I of England, ‘Edward Longshanks’, who had his sights firmly set on Scotland. Captured by Edward’s forces in Angus, John was forced to surrender to the English king. He was imprisoned in the Tower of London, but he was one of the fortunate few who made it out alive; in 1299 he fled to his family’s estates in Picardy, France, where he lived in self-imposed exile for the rest of his life. Perhaps fortunately for Scotland, there was another contender eagerly waiting in the wings: Robert the Bruce. The Abbey founded by Devorguilla offered protection to a community of Cistercian monks who named it ‘Dulce Cor’ or ‘Sweetheart’ in her honour. In the Middle Ages, the Abbey was the focus of a rural community, and the monks would have played an important part in farming and breeding livestock. The village where it stands took the name of New Abbey, and a corn mill, known as Monksmill, was built at the other end of the main street. 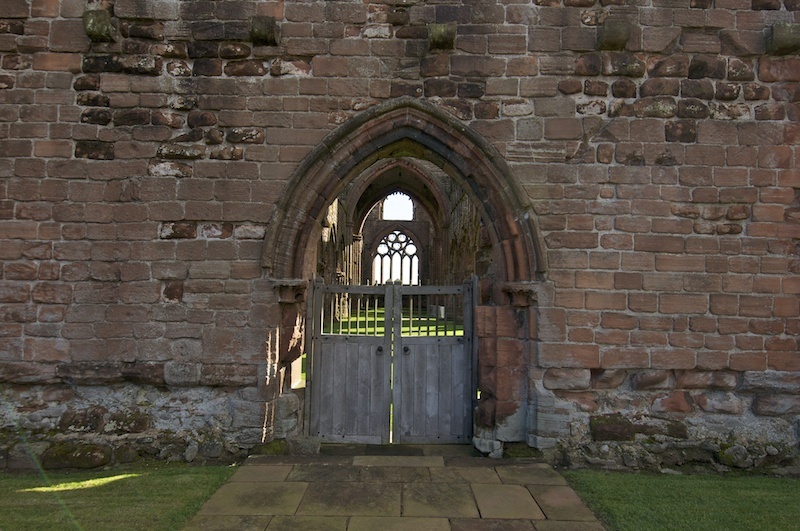 The monks’ occupation of Sweetheart Abbey continued until 1560, when Henry VIII’s purge of the monasteries forced its closure. 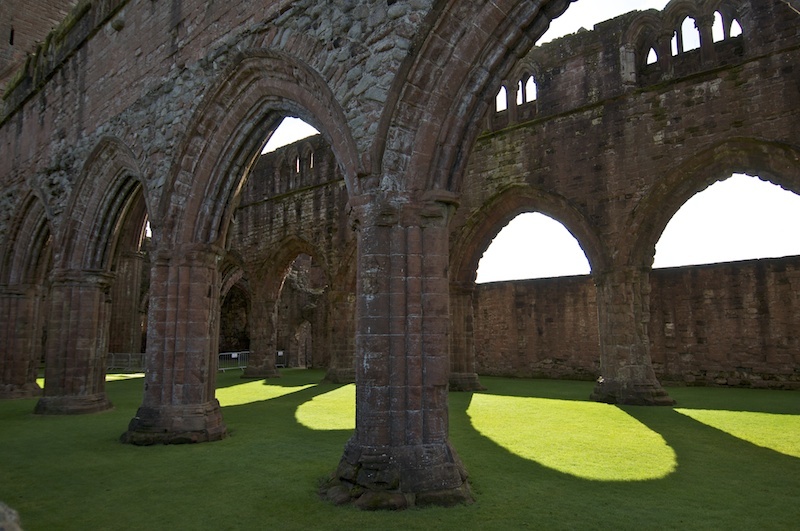 Sweetheart Abbey is under the protection of Historic Scotland; it is open seven days a week in summer but only five days during the winter. There’s an admission charge of £4 per adult. Wow you guys have the coolest stuff to visit!!! Thanks again for another great history lesson!!! And photos too!!! I was going to tell you my favorite but I can’t pick one!!! Thank you very much, David! I’m really glad that you enjoyed it. I love learning about it all myself. 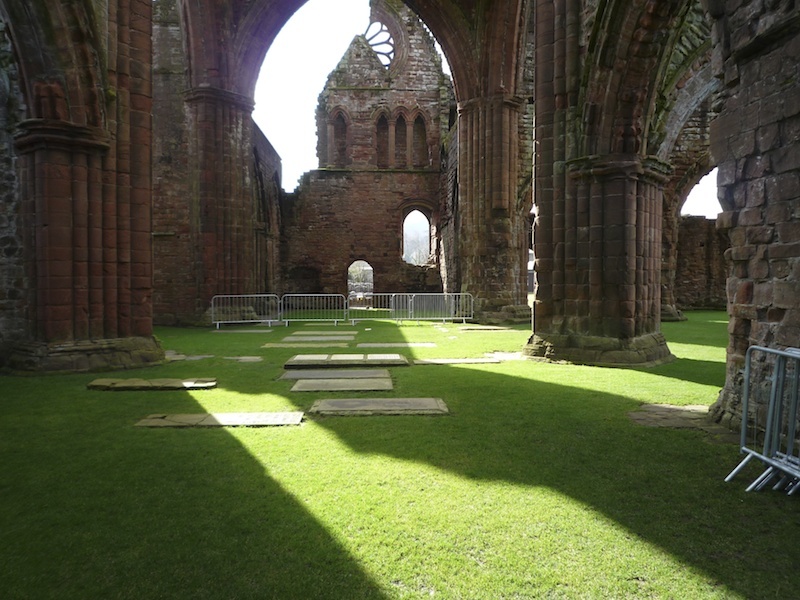 I love Sweetheart Abbey. It’s such a lovely colour. Many years since I was there. It’s a lovely place, in such a tranquil spot. Thank you for your comment! You have such a long rich history that lives on in architectural styles and buildings. Thank goodness there are no earthquakes in Scotland and Britain. Yes, thank goodness. We are very lucky.